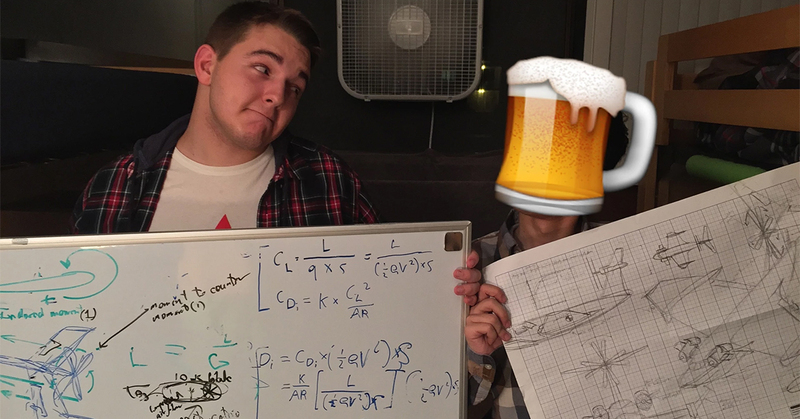 A student in Michigan got drunk last week and woke up to find he'd designed a plane. Remember how you got drunk, couldn't remember how you got home and woke up with a traffic cone in a wig, and have vague feelings of shame? Yeah, well this guy designed a functional jet. Keith Fraley, a second year software engineering student at Michigan Tech was having a normal night at home when his friend, who uses the pseudonym "Mark" for fear of being unemployable if people hear of his drunken exploits, burst in at 11:30, off his face and carrying several large rum and cokes. He left the room and two minutes later stumbled back in carrying a giant whiteboard, on which he proceeded to design a jet. "Alex, a friend of Mark’s, said that [earlier in the pub] he began staring at the ground and asked for pen and paper immediately." Keith told the Guardian. "After he sketched some designs, he said that he needed to leave and grab his aerospace mathematics textbook and whiteboard." When he got home and assembled his materials, Mark began drawing frantically, explaining his thoughts out loud and occasionally passing out onto his whiteboard. "Around 1.30am, he came back and he sat on the couch with a worn look on his face. He then fell asleep in his chair and woke up about an hour later basically questioning his sanity because of the immense amount of work that was in front of him, with no memory of his motivation to do it." Next time, he plans on "trying to cure cancer or to finalise his design plans for the craft in Siemens NX to be 3D printed later for prototyping."